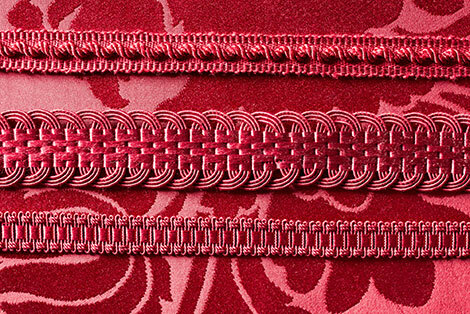 In regal burgundy / dark red we are reconstructing the passements from the Imperial era in accordance with historical patterns. 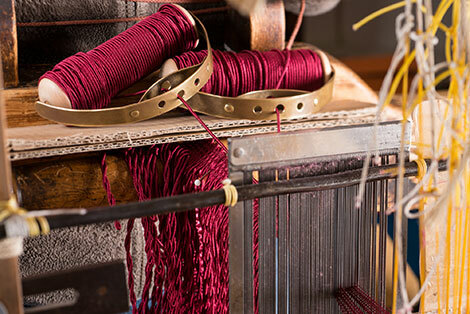 Our employees are producing 430 meters of stem fringes on the hand loom for the former residence of the Austrian Emperor. 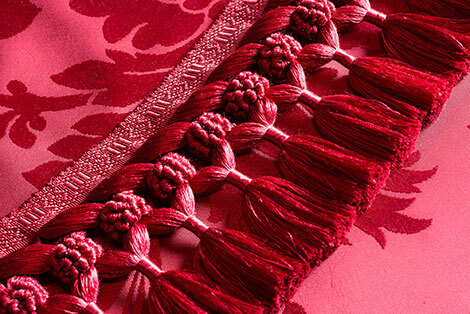 These will primarily adorn the curtains in different rooms in the imperial apartments. 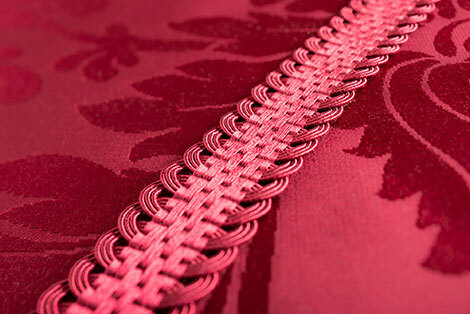 In addition, 945 meters of fringes for curtains were commissioned. 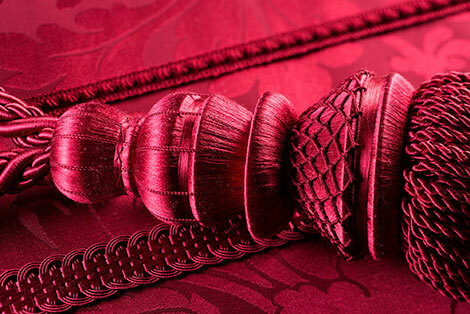 These are lavishly decorated with small tassels, approximately 33 pieces are distributed on one meter alone. 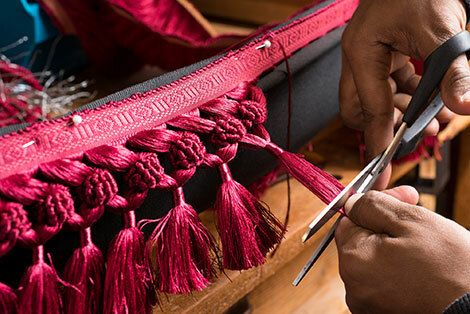 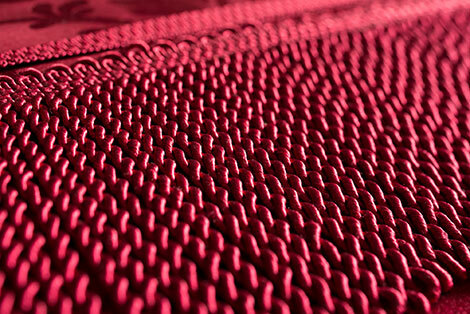 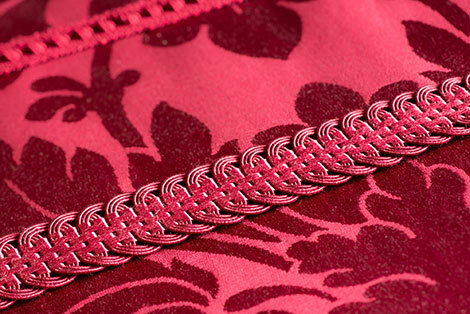 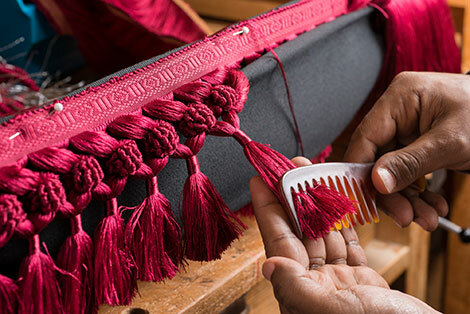 This corresponds to a total number of over 31,000 tassels, which are manufactured in our workshop by hand. 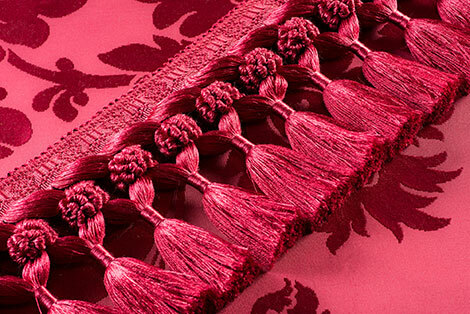 Each tassel itself is already a artistic decorative item. 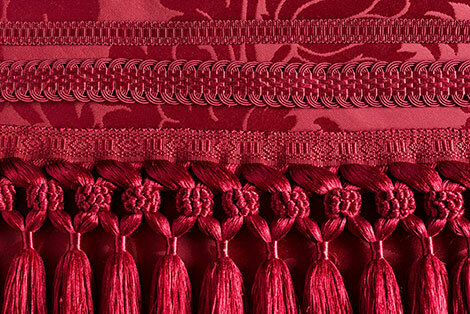 Even today, at first glance, recapturing the former imperial splendour and the desire for a suitably representative space requires an incredibly large amount of passements in the rooms of the imperial residences. 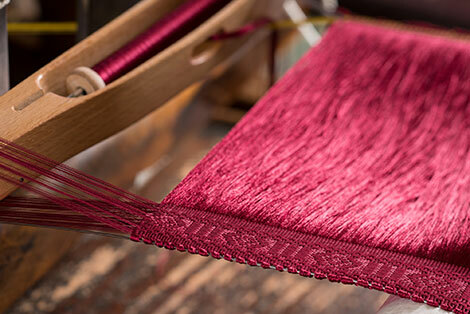 In addition, we are weaving various braids such as Bogenrepine (a braid with a special weave) for the curtains of the two Viennese castles, with a total length of about four kilometres. 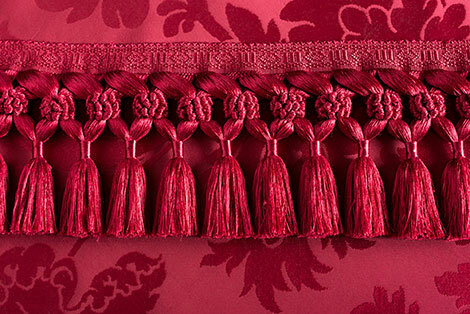 The tiebacks, which we are manufacturing for the job in Austria are also decorated with elaborate tassels. 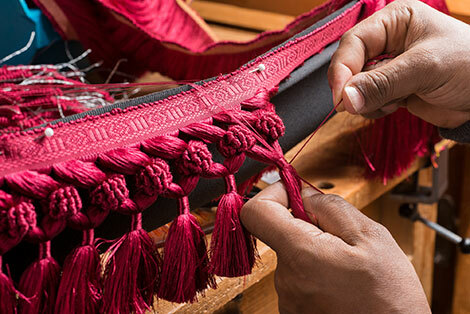 We are manufacturing 150 of the fine decorative items with a four-level wooden head and stem fringes for the Viennese imperial residences – of course, also by hand. 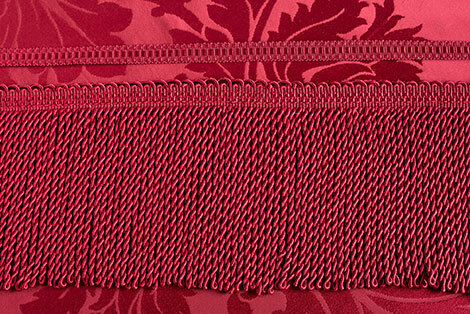 Many of these items are missing today in the imperial rooms. 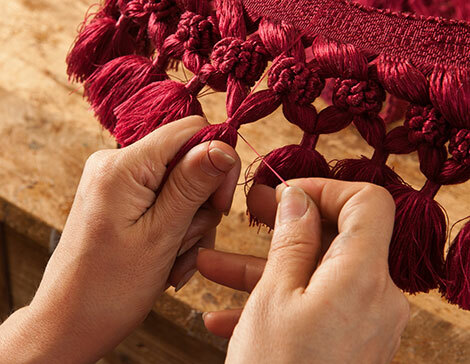 With the help of our passements, the original splendour of the imperial period will be recaptured in Schönbrunn Palace and the Vienna Hofburg. 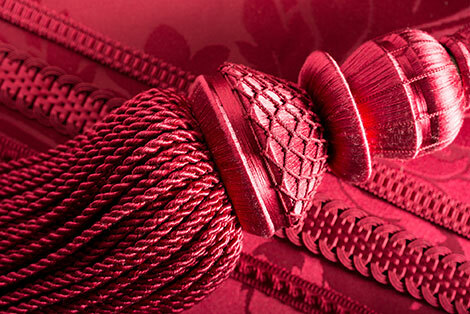 Our passements are in demand far beyond Germany’s borders. 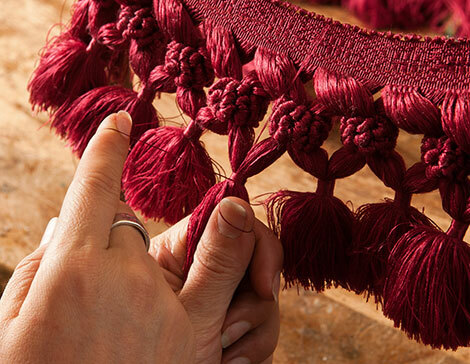 The Willet-Holthuysen Museum in Amsterdam commissioned us to reconstruct its tassels and upholstery buttons in the form of delicate flowers and stem fringes. 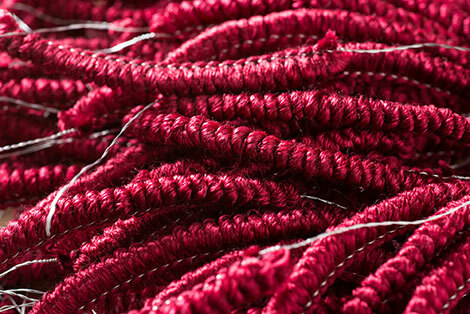 The challenge of this job lies primarily in the fine elements of very thin wire, which are hand crafted by us and produced using procedures specially developed for this contract. 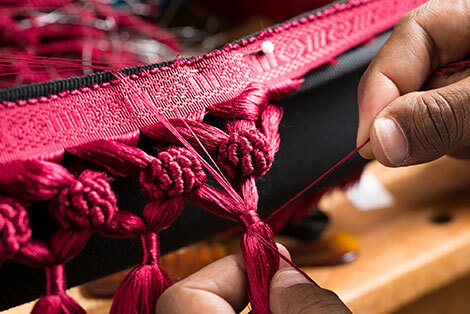 Since the originals are needed back in the museum as soon as possible, we must quickly but very carefully make a replica of each part to be reconstructed, on the basis of which the other passements are to be made once the originals are back in Amsterdam.